The featherweight division is currently being dominated by the American Max Holloway, but he could move up to 155 lb this year and the door would then be open for former great Jose Aldo to get his belt back. Aldo has lost twice to Max Holloway, but he remains firmly in the picture as the undoubted number one contender having knocked out Jeremy Stephens in round 1 in his last fight. Renato Moicano on the other hand is looking to establish himself as the clear number one contender to Holloway and beat his fellow countryman and one of the MMA greats in the process. The incentive for Renato Moicano is clear for all to see and he has the profile to back up being the -175 bookies favourite at William Hill. Moicano won the ‘Performance Of The Night’ award in his last fight, where he took no prisoners against Cub Swanson, finishing him with a round 1 submission victory. Barring a submission loss to Brian Ortega, Moicano has beaten most of the best in the division but fate brings him and Aldo together now, in Brazil, to figure out in no uncertain terms who is the top Brazilian featherweight challenger. 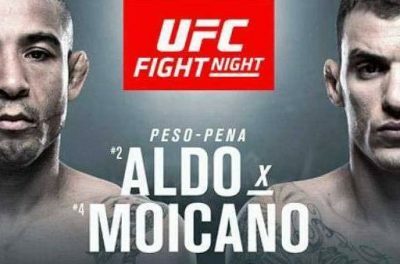 Looking at the latest Jose Aldo vs Renato Moicano betting odds have Moicano as the -175 favourite at William Hill and we think that could represent some great UFC betting value against Jose Aldo who is the +137.50 underdog also with William Hill. Beating Jose Aldo would be the dream of a lifetime and Moicano is in the perfect spot now to do just that. Winning this fight puts him in line for a shot at the 145lb title in the UFC and Moicano will be cherry ripe for the occasion.